The holidays are over and I am cutting back on the carbs. I was craving something sweet, with coconut and chocolate. I had a big bag of Almond Meal, so I thought I would use that. I also used Xylitol, which doesn’t give your blood sugar a spike. 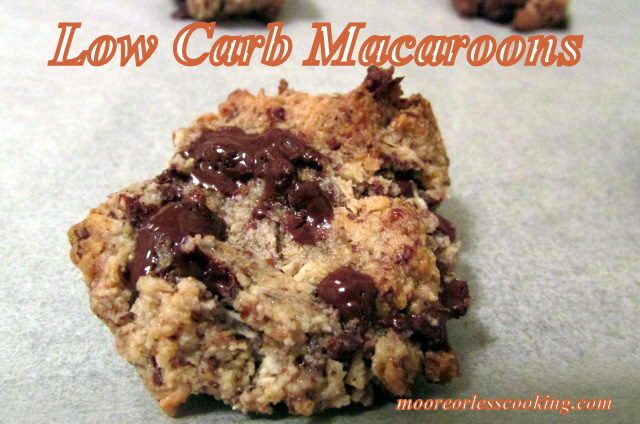 This is a delicious , easy macaroon with no guilt!! Easy Lo Carb dessert! Chocolate macaroon without all of the guilt! In a large mixing bowl, stir together almond meal, chocolate, coconut, baking powder, salt and Xylitol. In a separate bowl, beat egg. Whisk in coconut oil and vanilla. Add to dry ingredients, mix until just combined. Place in refrigerator for ½ hour. Shape dough into 1 ' balls and place on lined baking sheet, with 1½ inches of space between cookies. Bake until edges are brown, 7-10 minutes. ( Xylitol: is a natural substance found in fibrous vegetables and fruit, corn cobs and various hardwood trees like birch. Xylitol is also is a natural, intermediate product that regularly occurs in our glucose metabolism. Xylitol heals and repairs. It also builds immunity, protects against chronic degenerative disease and has anti-aging benefits. Xylitol has 40% fewer calories than sugar and can replace sugar in cooking, baking or as a sweetener for beverages. Xylitol also dramatically reduces the incidents of middle ear infections (if kids chew xylitol-flavored chewing gum), it is a perfect sweetener for people with diabetes, and increases your bone density and fights osteoporosis. My favorite aspect of Xylitol is that is helps with tooth decay since my daughter is prone to cavities. It helps to restore a proper alkaline/acid balance in the mouth and reverses destructive effects of sugar on oral health. It even has the ability to enhance the mineralization of the enamel and can stabilize cavities. In the last two years, I have put some Biotene mouth wash, which has Xylitol in it, on our tooth brushes with our tooth paste, and our cavities have stabilized. With so many health benefits, Xylitol is clearly the winner when it comes to sweeteners. I suspect we will see it appear in many more products very soon, hopefully replacing chemical, artificial sweeteners for good.